OnePlus is coming up with it’s new Hydrogen OS for Chinese OnePlus One users.Last month OnePlus released Oxygen OS for international users which is a beta version and has many bugs to be fixed. There’s a great need of a new OS for OnePlus as it officially ended the relationship with Cyanogen Inc. although the case raised by Micromax in India is solved but there’s no business relationship between Cyanogen Inc. and OnePlus. 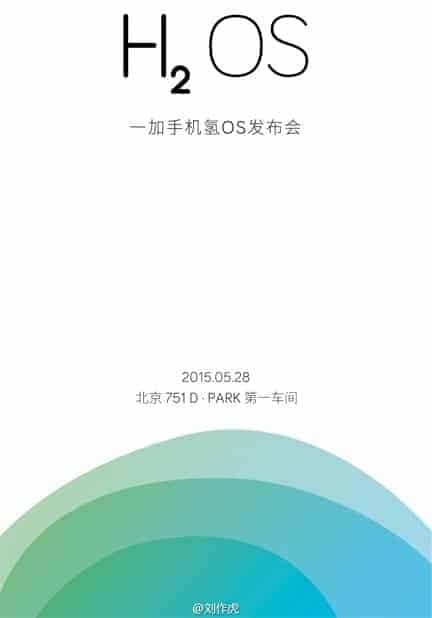 OnePlus One was first launched in China with it’s own Color OS while for the international users ( excluding India ) it is available with Cyanogen OS. For Indian users OnePlus made a OS based on kitkat as Micromax has already made business connections with Cyanogen in India ( for Yureka smartphone). As Google officially released Android 5.0(Lollipop) few months back, OnePlus made a new OS “Oxygen” based on Android 5.0 and made it available for the international users. Now there’s a need for Chinese OnePlus One users to receive Android 5.0, so it is coming up with yet another mobile OS namely Hydrogen OS which is also based on Android 5.0 Lollipop.It is reported that all the minor bugs like battery drain etc will be fixed in this new OS.The Chinese mobile vendor OnePlus is officially releasing the Hydrogen OS in china on May 28th. On the same day Google is going to release Android M at Google I/0 2015. OnePlus CEO Pete Lau said that, although there’re many ROMS in the market designed based on iOS who thought developing a ROM is just a modification of UI, but iOS isn’t the only benchmark, material design has it’s own flavor. We’re developing Hydrogen OS which will have different colors and added animations.